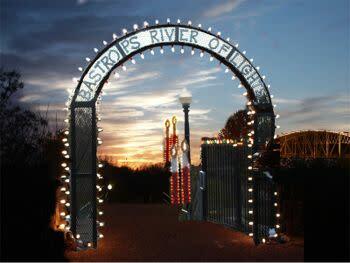 Time: Dusk until 10 p.m.
Take in the River of Lights, numerous lighted displays in a variety of seasonal themes lining Bastrops scenic June Hill Pape River Walk. . To access this one-half mile promenade, come down the stairs west of the intersection of Main and Pine Streets or select the fully accessible entrance at Fishermans Park on Farm Street.